Raise your hand if you have gone a day without watching video on the Internet. Very few hands raised, right? It’s hard not to watch video online. In fact, video is everywhere. Scroll down your Facebook feed and you’ll see it there streaming with out you even clicking on it. Scroll down Instagram, yup. There is it. You can’t run from online video. As a marketer and a small business owner it’s time to embrace it. Video is shared more often than any other kind of content. Instagram videos create double the engagement as photos. Remember when it came out that Tweets with images increase engagement? That proved to be true. So true that Twitter just announced that it will launch a video service in which you can watch longer videos on Twitter without having to leave the site or app. That’s pretty big news for engagement. 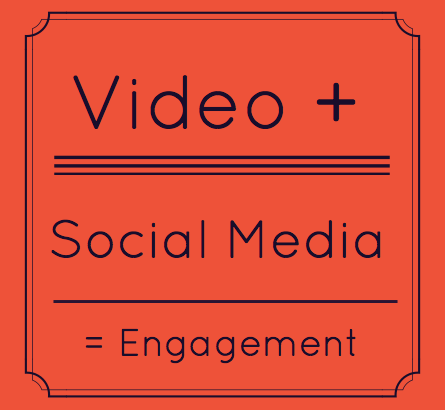 When it comes to Facebook, video also rules the engagement game. YouTube links are ok, but the real winner comes when you upload directly to Facebook. While photos make up more of the posts shared, video draws more engagement. Some businesses are seeing up to 53 percent more shares from videos. You probably know what I’m going to say right? Start creating video. It can be something simple like a hello. It could be a how-to, it could be a fashion show. It could event be a slideshare style video. The bottom line is that you need to incorporate video into your strategy in order to boost your engagement. Not ready to create your own videos? Start sharing videos from others to your social channels. This is especially crucial for Facebook where engagement has taken a nose dive. What will your video strategy look like in 2015?